Our Mission: To improve the quality of life for individuals with developmental disabilities and their families through advocacy, education, support and socialization. Do not miss the opportunity to participate in a live simulation of a disaster. Leaders from local agencies, First Responders, and the county's Emergency Management Team have developed a scenario to test how prepared you are for an emergency. This opportunity will not be presented again for several years so take advantage of this! More details here. The Arc of Blair County believes that persons with developmental disabilities are valuable members of society and have the same rights as all citizens. They have the right to a free and appropriate education in an integrated setting, the right to live in a comfortable residence in their own local community, the right to protection from health and safety hazards in their environment, the right to work at a meaningful wage in a vocation appropriate to their talents, the right to social and personal relationships and the right to participate in the recreational and cultural activities of their community. It is the vision of Arc of Blair County to foster, protect and nurture these rights. The Arc of Blair County serves as an important voice for persons with disabilities and their families. Why would you not want to do everything possible to save a life? 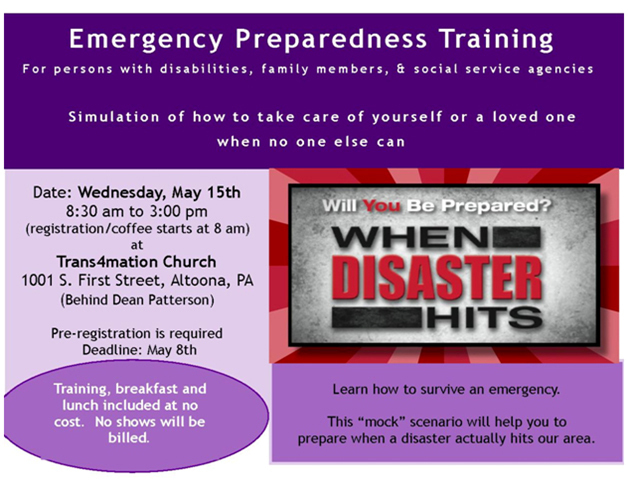 A training is planned for Wednesday, May 15, 2019 at Trans4mation Church in Altoona. This training is going to be a live simulation of an actual emergency. It is open to the public, but especially is geared towards individuals with ANY type of disability, including knee or hip surgeries. This type of training has never been conducted in our region. In fact, the committee could not find an existing model anywhere to use as a gauge in designing the day. Statistic from the last 15 years of natural disasters show that people with disaiblities are the last to receive help and many die during the emergency. WOO HOO - WE DID IT!! The Arc has had a very generous offer of a $5,000 donation to establish a trust fund if The Arc can secure the remaining $5,000. Well, it took some time, but we finally made it to our goal of 5k. The Arc will be placing $10,000 into a trust through the Central Pennsylvania Community Foundation ensuring the future of The Arc. The Board of Directors has voted to establish a community foundation trust with the expectation the fund will continue to grow through the stock market. The interest from the trust could then be used to assist families and self advocates with needs and to ensure the longevity and existence of The Arc of Blair County. There will be a listing of contributors published shortly. Thank you to those who made this goal a reality. Concerned About Issues? Are you worried about the lack of funding for people with disabilities in the state budget? Do you have concerns about competitive employment because of a disability? Are you worried about services following high school? Contact The Arc of Blair County to discuss your individual situation. We have over 60 years of advocacy experience. Resources on a variety of topics are available.